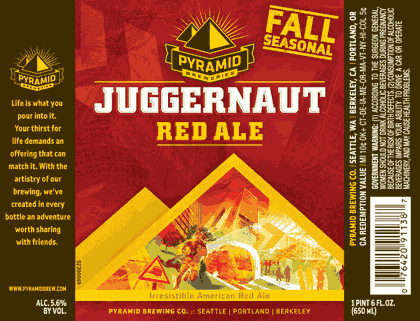 So I've mostly highlighted label art and beer design that I like, and that's successful. That's because I want to stay positive, and there's a lot of good stuff out there, and I don't want to put up a label and say "this stinks," which is unhelpful. Still, I thought it might be worth looking at a few examples of label art that tries to do something interesting and ambitious, but in so doing fails to make much sense or really produce a strong piece. The juggernaut in this instance is a train. Or maybe the guy running next to the train. Who cares? There are sharp angles and warm colors! Can't you feel the excitement? It makes me want to find a train, run alongside it, and go get acquired by a private equity beverage conglomerate with operations in Western New York. Seriously, what's going on here? This beer tastes like a train? This does not help me understand the product. Uh, so the beer is "dark and rich" like an alien? Or is it "dark and rich" like Ohio and a strange creature with roots? The beer is an imperial stout, I can see after a few minutes of searching text and random shapes, but I am still waiting for the mothership. 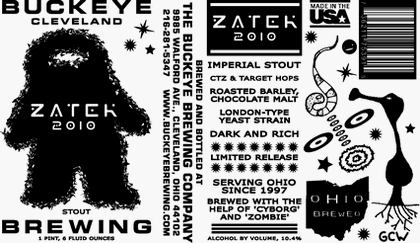 Look, I love how strange Buckeye's b-movie influenced artwork is, I love the attempt to go black and white, and I love sci-fi, but this is too creepy even for me. Seriously, Cleveland, I like the effort to do something different, but I think this label scared LeBron away. 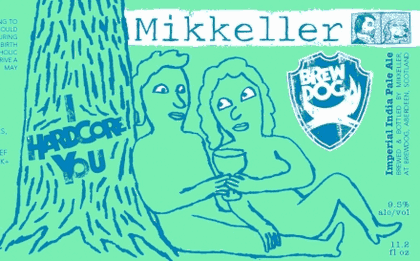 The beer is a fusion of two IPAs, and the image is a surprisingly sweet look for two notoriously stark and intense breweries, and then you realize the people are naked. Is this Adam and Eve? A post-coital drink under a tree? Nudists with a goblet? And the whole blue-on-sea green color scheme gives it an even stranger look. This might actually be a success, given the strange design tastes of the collaborators, but this label makes me feel pervy, not hot. As you can see, this yearly brewer's version of the session is a Baltic Imperial Porter. Apparently, the beer is strong, dark, Communist, and involves something that looks like a grim reaper with a rake being shot by Red Army soldier. 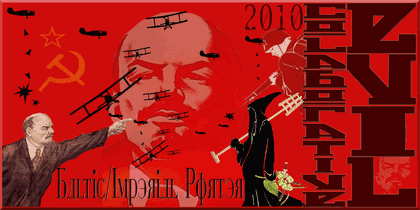 Also note planes of two different eras dropping bombs, and a third Lenin face in the lower right in the space around the big L. Yes, that quasi-Cyrillic unreadable text says "collaborative evil." Lots going on, lots of red, not a lot of making sense. I guess Communism is evil? Or collaborative? Or Baltic? Maybe Imperial? I assume a lot of beer went into this design. More specifically, a lot of beer went into the people who designed it, right before they went to work. I kind of like the Mikkeller one. Certainly is the most memorable. Odd for odds sake I suppose. I agree with you on the rest. I always enjoy your blog, but somehow it really is more entertaining to read a more critical post like this one. I laughed out loud at "This beer tastes like a train." The grim reaper in the Collaborative Evil piece is holding a brewing paddle in one hand and what looks like hops in the other (the image is too small to be sure). This is an image that homebrewers and professional brewers alike would understand on sight. But, of course, the majority of beer drinkers are not homebrewers or professional brewers. I agree that the image is visually confusing with too many elements, and they took the social realism bit too literally. But I think the biggest mistake in that one is the brewer designing too much for themselves without thinking of the intended audience. Oh, that's a brewing paddle! I never even thought about that, but of course you're right. But why is he a grim reaper with a brewer's paddle? Honestly, that image alone could be the basis for a label design, but here it's an accent. Still, your point about designing for brewers is well-taken. The point of design is accessibility, but the collaborative evil label kind of looks like a big in-joke.